Ice, ice baby! Do you need something to cool off a hot spot in your garden? Well, look no further. 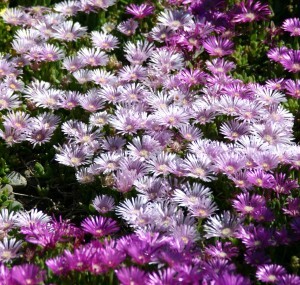 Lavender Ice (Delosperma ‘Psfave’) is a new comer to the delosperma genus that is sure to fit the bill. This icy hot little plant comes to Plant Select® from the plantswomen of Perennial Favorites in Rye, CO, Diana Capen & Merrilee Barnett. It is a sport of TABLE MOUNTAIN® ice plant (Delosperma ‘John Proffitt’), keeping the same great mat- forming foliage that tinges purple in the fall and winter. The difference is the shimmering iridescent lavender flowers with a striking dark eye that will keep your hot spot cool all summer. Lavender Ice is sure to please in a variety of garden conditions, but prefers well- drained soils in a full sun situation. Less is more with Lavender Ice so keep it on the dry side when irrigating and you’ll have a thriving plant covered with a glistening show of flowers all summer. Avoid a situation of winter snow cover and Lavender Ice will return year after year to dazzle your garden with sparkling color. Lavender Ice combines well with agastache, penstemon, salvia, & other delospermas, providing a glittering carpet of lavender flowers to compliment the purples, oranges, and reds of these garden staples. As the hot days of summer have your garden longing for a cool drink, Lavender Ice will provide the frosty glass of color that hits the spot. Thank you for redirecting us to the plant profile and the video. Help us better understand the whole plant.